One listen to Archie Pelago’s music and it’s clear why the trio is so highly-touted among those who are ‘in the know’ in New York’s creative circles. Their virtuosic melange of jazz, new music and electronics exudes the sheer joy of improvisation and manages to deliver on what the frequently misused label ‘Fusion’ promises, but all too often falls short of. We met Cosmo D (Greg), Hirshi (Dan) and Kroba (Zach) at Archie Pelago HQ in Brooklyn, New York to learn more about their methods of creative collaboration in the studio and on stage. 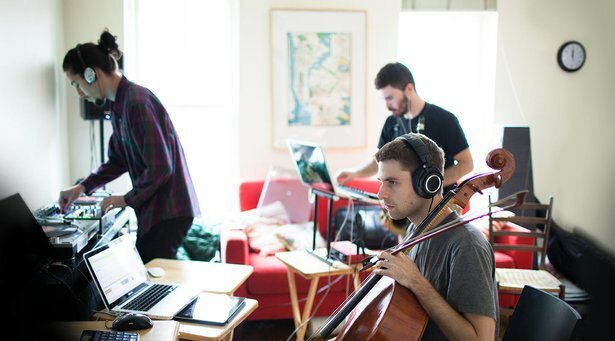 Cello, sax, trumpet, DJing and electronics – how does it all fit together? Cosmo D: I started with cello as a child and later got into Ableton Live. I’ve always been very interested in improvisation – and cello and Live work great together. Over time, the two have fused into one thing, which feels very organic. Kroba: I was always searching for a wider spectrum of sound for my saxophone. Initially I used effects pedals, but after Greg showed me Ableton Live, I’ve been using it exclusively. I use Live not only as an effects rack but also for real-time looping, resampling, complex Max for Live applications, just everything. With Live I can play sounds and tonal structures that were not previously possible. Hirshi: I studied trumpet and I still play it on recordings, but my focus these days is on DJing. What fascinates me most of all about it is that I can experiment freely and spontaneously and react to the audience. To me it feels exactly like playing any other instrument. How do you bring all these elements together technically? Kroba: Each of us has his own laptop with Ableton Live. Hirschi’s computer is also running Serato for DJing, it’s synchronized with Ableton through The Bridge. Both of the other Live computers are connected to Hirschi’s system via MIDI-sync so that they always follow his tempo. Whenever Hirschi starts up a track in Serato he sets the master tempo and all three Ableton systems are synced to it. Hirshi: All the audio signals go through my DJ mixer [Rane Sixty-Eight]. There I have separate channels for the output of my Serato/Live system as well as for the Cosmo D’s and Kroba’s Ableton Live outputs. Cosmo D: When we’re playing, each of us will start clips or record a new clip in real time. Because this has to happen on the same beat, or at least on the same quarter note, the MIDI synchronization between our computers is extremely important. We don’t have a click – we hear the same music that the audience does – but we can improvise and always be sure that we all have the same ‘internal metronome’. Archie Pelago’s set-up with three Ableton Live systems synchronized to Serato, Push and various controllers. You also use various controllers with Live. Cosmo D: Yes, they’re important for being able to play Live simultaneously with our acoustic instruments. Kroba and I each have a Keith McMillen foot controller [12 Step]. We use it mainly to step through Ableton Live’s Session View, and to spontaneously record our cello or sax as audio clips in order to play them back later. In addition, each of us has an iPad with Lemur for controlling effects in Live. We limit our iPad control layout to one or two pages max. so that we don’t get lost in too many possibilities. At first glance, our set-up might seem somewhat complicated, but in practice it’s quite efficient. You’ve mentioned ‘resampling’, by that do you mean the real-time recording, looping and playback of your sax and cello as audio loops? Cosmo D: Yes, exactly. For example, when I’m playing my cello the signal goes directly from my audio interface [Motu MicroBook II] into one channel of Live’s Session View. The audio output of this channel is routed to the input of another channel that I’ve armed for recording. On my foot controller – in MIDI assign mode – I’ve assigned one button to the Track Launch function of the recording channel. So that means, while playing the cello I can start recording in a selected clip slot. The recording goes on for a pre-defined length of time and then, with the same foot controller pedal, I can start playback of the clip I just recorded. You’ve recently integrated Ableton Push into your setup. How has that worked for you guys and what role has Push come to play? Hirshi: I use Push to trigger samples, make beats with the step sequencer or to start clips. Before, I didn’t really know Ableton very well but through playing Push over the course of the last year I’ve gotten familiar with Live. It’s the centerpiece of my set-up now. Kroba: Push is still new to us but I’m definitely interested in using it as a sampler. If I can make a percussion instrument by sampling a teacup and then put this sound into a drum kit and play it with all the possibilities that Push offers – that’s a very intuitive way of turning audio recordings into musical ideas. Cosmo D: What I find most interesting is that Push has opened some doors for us that we would never have found otherwise. When we play sounds or Racks in Push, the are always some parameters on the encoders and knobs that we wouldn’t have looked for ourselves. So you just twist and turn here and there and all of the sudden you’ve transformed the material into something exciting and new. This means that we can play with our recorded material in a more intuitive, more unconventional and more drastic way than was ever possible with just a mouse and a screen. We’re not afraid of really mangling the material to see what will happen. And it doesn’t matter if we’re doing this to synths, drums, or to our own recorded instruments, I think this new way way of playing musical material is really exciting. How do you come up with your songs? Are they always jams that you edit later or do you work more conventionally? Kroba: We don’t have any one particular method, instead we’re always trying out something new. Sometimes we’re all sitting together composing a synth part. At other times I’ll record a chord progression at home and send it to Cosmo D to play something over it. Or Hirschi will make some drums on his iPad while he’s on the subway and the we’ll jam to that at rehearsal. Real instruments are always important to us. Besides our instruments – cello, sax, trumpet, clarinet, or flute – these can be sitar, bells, violins, kazoo, toys, teacups as percussion… basically anything we can get our hands on and that we think might sound interesting. Cosmo D: Each of our remixes and tracks has its own story, but it’s always a democratic process. Each of us has produced, arranged and mixed his own material. That makes it easy for us to discuss things on the same creative level. It’s always an open conversation. How do you translate your studio productions for the stage? Cosmo D: This used to be more rigid than it is today: we would first identify the most important parts of tracks – the beats, bass and drums… We would get rid of the rest in order to leave room for what we wanted to fill in live on stage. We would often rework the structure, making parts longer or shorter. Then we would rehearse to see if this base (what we call the “dub”) worked as intended – most times, it didn’t at first [laughs]. Then we would work on the structure in Ableton until we were satisfied and then render the parts again… Since we’ve integrated Push into our setup, our dubs are neither as complex nor as static as they used to be. We now go much deeper into the arrangement and export smaller particles that Hirschi can trigger in real time with Push. We’re much freer on stage now than we used to be because we can change the flow and the structure of any song at any time. Hirshi, on stage you mix in loops and samples from other artists. How do you decide when and what to bring in and how do you balance your own material with others’ tracks? Hirshi: Naturally, I prepare and think about what tracks would go well with certain tracks of ours. But on stage I’m always free to decide spontaneously and try things out. You have to develop a sense of how the audience will react. Sometimes we have the feeling that people want to hear more of our own tracks, sometimes they really get into the mixed-in tracks. Sometimes I throw in something completely unexpected and it’s up to them to react. Cosmo D: In this sense, Hirshi is our director, our conductor, our master of ceremonies on stage. He determines the tempo and the direction. Sometimes he’ll throw in something that even surprises us, we look over at him and say “Really? He’s playing that track now, he’s going there? But we’re here right now! Oh well, let’s go over there then!” We’re challenged to react appropriately and as a result, being on stage stays fresh and exciting for us. Hirshi: Nevertheless, I’m not just doing my own thing up there. I’m always careful not to fill up too much space sonically, but to provide Greg and Zach with an acoustic stage where they can go wild. How do you transition between songs, for instance when Hirschi mixes in a track in another key? Kroba: I’ve worked as a DJ myself and been into DJ culture for a long time. So I have a feel for that particular kind of multi-tonality that can result from mixing two tracks together. It’s not always a case of needing to resolve this friction as quickly as possible – instead, you can play with that aspect of it too. Sometimes I’ll even keep playing a melody for a while and let it fade over a long time in order to savour this tension. Cosmo D: For us, it’s like a game, a musical obstacle course, unfolding before our eyes and ears - put together by either Dan or Zach or me. For me the key to this game is consciousness, I’m aware of what my bandmates and I are doing at any moment. Usually, I know the song that’s being mixed in and where its groove and tonality is going. I therefore know approximately what direction I need to go. I know how I got there in previous jams or concerts and I decide whether today I want to get there by the same route, or take another path. Do you use any particular effect or techniques to achieve these transitions? Kroba: Yeah, sure. The standard tool is of course a lowpass filter for gradually taking out the high frequencies. But also, I transpose clips in real time. When I’m playing a clip in C Major and the next track is in D Major, I just transpose the clip one whole step up in Live. That way I land in the tonality of the new track but I’m still playing the musical idea of the old track and can merge the two. Cosmo D: Live has always been great for these kinds of spontaneous transformations and modulations. And the resampling that we mentioned earlier is part of that. All in all, the most important tools for transitions are: filter, delays, transposition, resampling, and all the dynamic processing in general – by that I mean dynamic effects, and just plain old fader moves too. Hirshi: And then there are the transitions that we just play live; no clips, no effects, just pizzicati on the cello, or whatever. Sometimes, this type of simplification is the best solution. It’s exciting and very liberating to have all of these possibilities. Find out more about Archie Pelago.